We firmly believe that satisfied customers are our best form of advertisement. Our landscape division has strived to build a solid reputation in our community through the highest quality landscape services. In addition to planting trees and shrubs, seeding and sodding, our landscape division also creates; water gardens, retaining walls, patios, and walks. 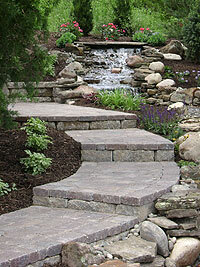 Our designers are graduates of Kansas State University with degrees in Horticulture specializing in Landscape Design. They have the knowledge and expertise to transform your ideas into a beautiful, functional landscape that you can enjoy for years to come.